Takase's Dot Fighters is an impressive work, though there is less to admire in his debut effort. Arm Joe features inconsistent sprite design and unbalanced gameplay issues, among other glaring problems. 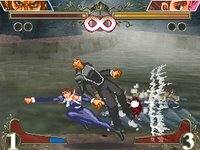 Certain characters depend on slide moves to win, while others have a special attack that could drain the entire life gauge in mere seconds. The final boss is impossible to beat, which is understandable since by using Judgment a player can actually complete the game by pressing a single button repeatedly. No timing or directional keys required even.